L. Lee Smith focuses his practice in the area of federal litigation. He is also a mediator. In addition to his white-collar criminal defense practice, he has represented businesses and individuals against claims of employment discrimination and in complex commercial litigation, including ERISA. 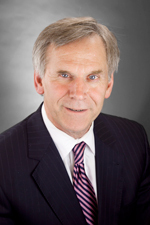 Mr. Smith joined Hinshaw & Culbertson LLP in February 2001. He is the Partner-in-Charge of the Peoria office. Instructor, Attorney General’s Advocacy Institute, U.S. Department of Justice, Washington, D.C., (1985 – 1990). Coordinator, Financial Institution Regulatory and Enforcement Group (an interagency, banking crimes task force), Central District of Illinois, (1988 – 1990). Evaluator, U.S. Department of Justice, Evaluation and Review Program for United States Attorneys’ Offices, (1988 – 1990). Before joining the U.S. Attorney’s office, Mr. Smith served a two-year judicial clerkship with Chief Justice Joseph H. Goldenhersh, Illinois Supreme Court, Belleville, Illinois. He also was an instructor at The University of Illinois College of Law in Champaign. Mr. Smith was a charter member of the American Inns of Court, A. Lincoln Chapter, Peoria, Illinois. He was a Master of the Bench for seven years, and is currently an Emeritus Member. In the Fall of 2005, Mr. Smith completed intensive training in mediation from the faculty of Pepperdine University School of Law’s top-ranked Straus Institute for Dispute Resolution. Recognized by his peers as a Leading Lawyer in the area of Criminal Defense Law: White Collar. “Investigating Employee Misconduct,” for the Community Bankers Association of Illinois seminar, “A Guide to Human Resources Law,” in Springfield, Illinois, June 2008.